The expansion of runways, taxiways, and parking areas at a Regional Airport located in the State of Pennsylvania made it necessary to update the storm water drainage system to accommodate increased flow rates. The lead design engineer located in York, PA was responsible for the expansion of all three phases of the project over a span of 12 years until completion. The EPA requires facilities that engage in regulated industrial activities to obtain NPDES permits before discharging to storm water. The Airport’s de-icing and fueling facilities are specifically identified as industrial activities subject to the NPDES regulations. NPDES permit. The CWA has been interpreted to cover all surface waters, including any waterway within the U.S. Also included are normally dry creeks through which water may flow and ultimately end up in public waters. Some examples of public waters include a river, stream, or a tributary leading to a river or stream, lake, reservoir, bay, gulf, sea, or ocean within or adjacent to the U.S. The CWA jurisdiction may also reach groundwater if it is directly connected hydrologically with surface waters. to be deposited beneath the surface of the water or upon adjoining shorelines. More specifically, an oil waste having average oil content greater than 15ppm. The engineers specified an Oil/Water Separator system on each phase of the project to satisfy the Airport’s National Pollutant Discharge Elimination System (NPDES) permit. The engineer selected a Highland Tank Model HTC-30,000 US Gallon “EZ Access” Oil/Water Separator for each phase, designed for the treatment of contaminated storm water runoff from 0-3,000 gallons per minute, discharging with a qualified/certified effluent quality of 10 ppm of free oil and grease. Highland Tank’s Oil/Water Separators meet the Underwriter’s Laboratories, Inc. UL-2215 for design, construction, and performance standards for engineered Oil/Water Separators. Currently, code enforcement officials consider UL-2215 certification as being the preeminent national consensus standard for oil/water separator construction and performance. The Oil/Water Separators are designed for gravity separation of free oils (hydrocarbons and other petroleum products) along with some settle-able solids from the wastewater. grease, and oily coated solids discharged by a wide range of industrial facilities. The Corella® inclined parallel plate coalescer with removable, corrugated plates, sloped toward the sediment chamber, and built in accordance with API-421 sizing calculations. The parallel plates direct the flow of the separated oils to the surface of the tank and separated solids to the bottom. A sectionalized removable Petro-Screen™ coalescer, designed to intercept oil globules of 20 microns in diameter or larger, is located at the effluent end of the oil/water separator tank for further treatment of the wastewater. Upstream of each of the three oil/water separators, the engineers specified an additional Highland Tank treatment vessel with a Model HT-DB 15,000 gallon Oil/Sand Interceptor Tank. The double basin interceptors are engineered to intercept and collect sand, grit, grease and some free oils before entering the primary treatment tanks. The primary function of the Interceptor is to retrofit with the existing 30” concrete storm water pipes at the site. 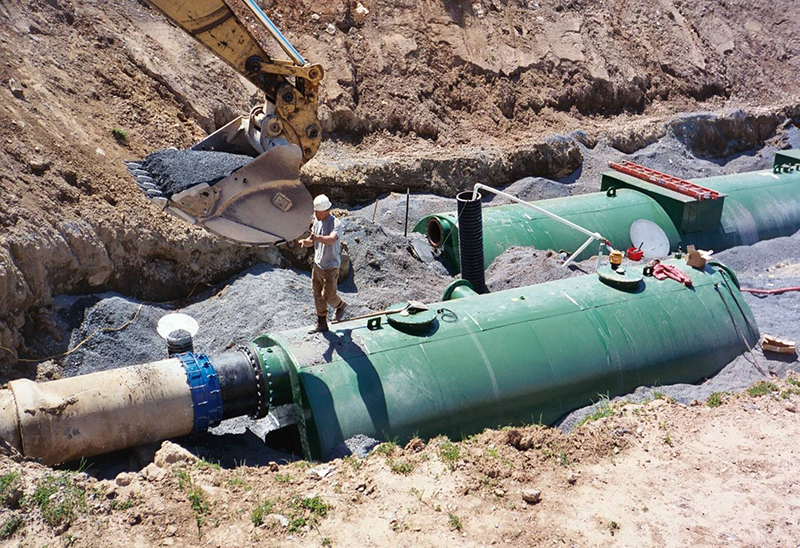 The double basins were equipped with an Overflow Bypass to direct the targeted treatment rates of 0-3,000 US GPM to each of the Oil/Water Separators and prevent overloading in the event of a major storm. UL standards. The HTC-30,000 gallon Oil/Water Separators were supplied with a high oil level alarm (audio/visual) and an EZ Access Manway design. coalescers from above. Every effort has been made to ensure that storm water discharge from the expanded facility will offer no threat to the surrounding environment or water quality.